A Digimon that holds the role of a miko, acting as an agent of God's will. 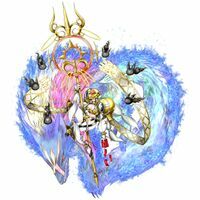 Like Taomon, it freely uses Onmyoudou techniques in battle, and has the ability to employ God Beast-species Digimon. It always carries four pipes on the belt around its waist, within which lurk four kuda-gitsune. It is able to use these kuda-gitsune for everything from attacking to gathering information. Just like Holy Angemon's Priest Mode, it is able to change into a Miko Mode which administers Shinto rituals. Its Signature Move is attacking the opponent with the four kuda-gitsune carried on its waist (Izuna). The four kuda-gitsune possess the attributes of "Fire", "Water", "Wind", and "Thunder", respectively. Its Special Move is striking the ground with its "Kongou Shakujou", spreading a purifying barrier that exorcises evil spirits (Kongoukai Mandara). Beginning with necromancy and Onmyoudou, it has grown into a specialist who has mastered every secret art that has been passed down throughout the eastern Digital World. By attuning itself closely to the Digital World's nature, it is able to transform various object data such as flora and rocks into shikigami in the shape of flowers or foxes, and order them to do its bidding. It is skilled in using its kuda-gitsune and shikigami for reconnaissance and espionage; acting as a watchman of the darkness, it strikes at its foes from the dark using the information it has obtained. Its new Special Moves are turning all of the objects around it into countless shikigami, enveloping the enemy in a storm of flowers and annihilating them (Konohanasenki-banshou), and fusing its four kuda-gitsune, which possess power over each of the four elements respectively, into a single gigantic fox spirit and summoning it (Uka-no-Mitama). Starting with necromancy and onmyodo, it has grown into a specialist who has mastered all sorts of secret arts, and is renowned throughout the east of the Digital World. It is skilled in using its kuda-gitsune and shikigami for reconnaissance and espionage; acting as a watchman of the darkness, it strikes at its foes from the dark using the information it has obtained. From Konohananosakuya-hime 「木花之開耶姫（コノハナノサクヤヒメ）」, a character from the Kojiki, an ancient book of myths. 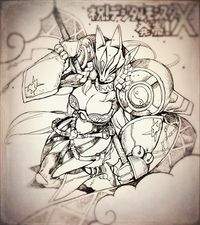 Sakuyamon X-Antibody was designed by Watanabe Kenji. After releasing the original prototype design, Watanabe was asked to make Sakuyamon X-Antibody more revealing, and to add a giant fox. Kongoukai Mandara  Diamond Realm Mandala 金剛界曼荼羅 N/A Strikes the ground with its "Kongou Shakujou", spreading a purifying barrier that exorcises evil spirits. Konohanasenki-banshou  All Forms of the Plum Blossom Warrioress 此ノ花戦姫万象 N/A Turns all of the objects around it into countless shikigami, enveloping the enemy in a storm of flowers and annihilating them. 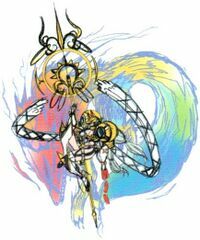 宇迦之御魂 N/A Fuses its four kuda-gitsune into a single gigantic fox spirit and summons it. ↑ Sakuyamon X-Antibody's initial artwork was illustrated by Watanabe Kenji. This page was last modified on 21 March 2019, at 20:31.